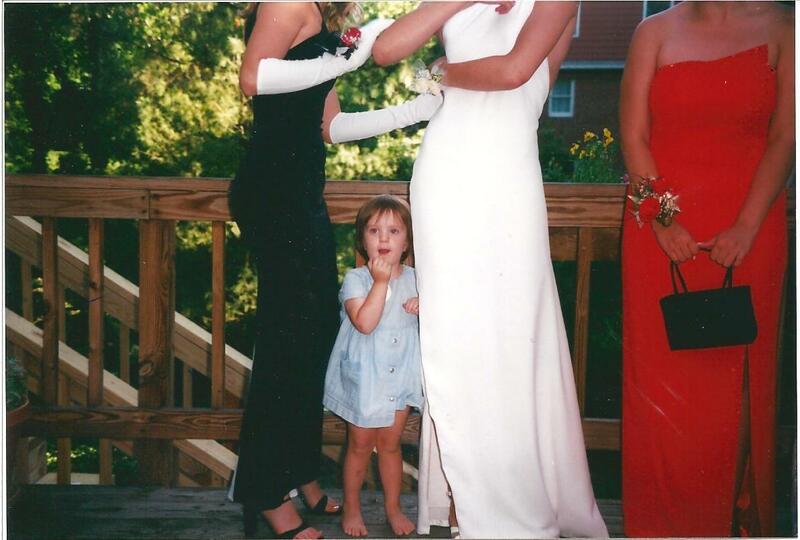 My mom snapped this photo of my little sister during a pre-prom party my senior year of high school. I love seeing the moment from her unexpected tiny perspective on the ground. In that second in time -which we high school girls thought was all about us- the pic shows how really any moment is everyone's moment. We're all experiencing it from our own perspective and forming our own feelings & opinions even if we're not the one in the spotlight. along with my headless best friends, Veronica & Alissa. That is really an amazing picture. Your mother could enter that in a contest--seriously. Can we see a picture of all of you? I bet you were beautiful!!! Lauren- What a precious picture! Your sister looks like she was ready to head out to the prom with you if you would let her! So sweet! Your dress is just stunning and looks like it would NEVER go out of style! You have a very talented grandmother! Great sentiment, Lauren. So it looks like you've always had style, great dress!! Aww, so cute. I love how you know we all take away something from the moment! *** Delightful thoughts of heavenly, carefree days... and your cute lil' Sis has, by now, experienced HER own, very special heavenly times, too... such a lovely heartwarmer!! And how wonderful to HAVE this pic!!! From what I can see, your Gram is a treasure~~~ looks like it would have been a BEAUTIFUL WEDDING DRESS, too! i didn't know you had a baby sister. awwww chat! soooo adorable!!!! Beautiful way to make a point, Lauren! "Any moment is everyone's moment" - love it! And that Vogue dress? Amazing! This is the most precious thing I've ever seen! And the white gown is gorgeous! Don't you love Vogue patterns? I love photos that are taken from an unexpected perspective like this. I had two older sisters and can remember the feeling of excitement when they were getting ready for a big school dance. That is such a stunning photo and your little sister is so cute! I am the baby in my family and remember thinking my sister (10 years older) was so cool with her long red hair and gorgeous body, but boy was she bossy. And I mean really bossy, I stayed with her most summers when I lived in London and she would make me use the same cup all day. Can you believe it? The horror! And I am so diggin' red, black and white right now! What a great photo! We have some big age gaps in our family too and I think it makes for some interesting sibling relationships. ....I was sewing my dress when my date arrived! eeek. That was a priceless moment! So fun! so excited to see the store! You really nailed it. What great insight. Thanks for sharing and making all of us more mindful of others sharing "our" moments. I wish I could say something profound, but there's nothing left. Your photo and your post say it all. Your gown is stunning too. This is most adorableT There is quite a large gap between you and your sweet little sister. It's a bit like in our family. My oldest is 13 years older then his youngest brother! I love your observation about everyone's moment. So true, how often do we see life only from our own prospective! girlfriend you never told us about your modeling days! how gorgeous are you!